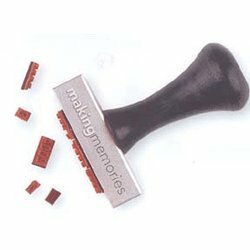 The Making Memories Magnetic Date Stamp Kit. Each individual stamp has a magnetic receptor that attaches to the magnetic stamp base. A line on the base helps you achieve a straight line, or scatter the stamps on the base for a whimsical look. Have fun putting the date on anything! In addition to January to December month titles, this kit includes abbreviated month titles from JAN to DEC, the years 1980 to 2010, days of the week, numbers 1 through 31, st ,nd, rd, and th, heart, star, flower, and leaf shapes, Fall, Winter, Summer, Spring, Christmas, Birthday, and New Year title magnetic stamps This stamp comes in a sturdy tin case for storage Handy placement tweezers included Letters measure approximately 1/8" to 1/4"